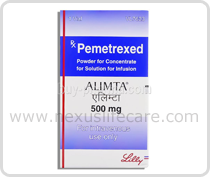 Uses:- Pemetrexed injection is used with another chemotherapy (anti-cancer) medication to treat malignant pleural mesothelioma (a type of cancer that affects the inside lining of the chest cavity). Pemetrexed injection is also used to treat non-small cell lung cancer. Pemetrexed injection is in a class of medications called antifolate antineoplastic agents. It works by blocking the action of a certain substance in the body that may help cancer cells multiply.